Editor’s note: This article originally appeared on our sister site, TechNode Chinese. If you’re working in a Chinese company, then you’d better be prepared for Chinese New Year’s Eve, the best time of the year to grab red envelopes on your WeChat group. Chinese people give red envelope (hongbao, 红包) with money to their younger children and co-workers as a wish for good luck in the new year. Nowadays, Chinese people give hongbao using WeChat and Alipay, and it’s also the best time for Chinese companies to run on hongbao marketing bringing the term ‘hongbao wars‘. Over the six-day Chinese Spring Festival period last year, 516 million people sent and received 32 billion digital red envelopes, which is 10 times the number as over the same period in 2015. Forecasters are expecting up to 100 billion digital envelopes to be sent and received around the world this year. On Chinese New Year’s Eve day, your Chinese boss will send out a digital red envelope on WeChat group, which is then often grabbed by your peers in only a few seconds. Three things matter: your hand speed, the speed of your phone, and the network speed. If you cannot guarantee any of these three conditions, then these tactics might be useful to you to compete against your colleagues to secure your hongbao. The latest version of iOS allows user to automatically grab the red envelope using iTools. How to: open the iTools click on the bottom bar “more”, open automatically grab red packets. 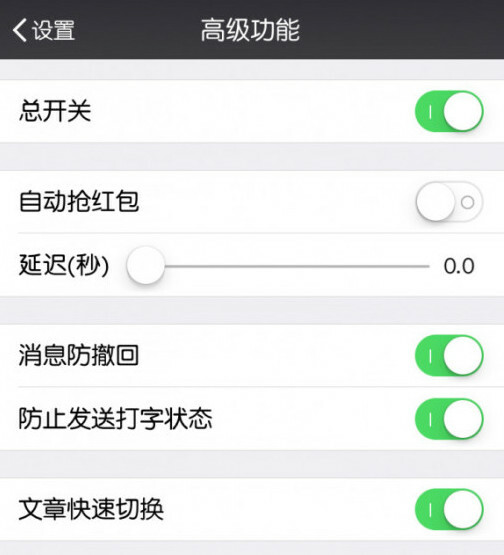 A WeChat’s plug-in called “Fun-multiplier For WeChat” can help you too. Go to the WeChat settings, where it supports a variety of plug-ins: for example, to prevent the withdrawal of information, to alarm you specific time, to automatically grab red packets, to prevent typing state, and to edit your custom location. Many Chinese mobile phones, such as Xiaomi, Meizu and Nubia have provided “red envelope assistant” (红包助手, hongbaozhushou). Huawei recently released the latest red envelopes application, supporting WeChat, and sending out hongbao reminders on Alipay. The software supports Huawei EMUI version of EMUI 3.0 and above. Meizu phone will instantly notify the user with a notification saying, “You received a red envelope.” When the user clicks on the reminder, they will be able to grab a red envelope. Activation for the click is; Settings – Accessibility – Red envelope assistant, open the red envelope assistant. When received a red envelope on Xiaomi phone, it will give you a reminder on your screen. In addition, MIUI supports major online platforms to grab red envelopes, set an alarm, and provide you the timetable to grab a red envelope to give you more opportunities to grab red envelopes. MIUI developer ROMs already comes with the function, and the users using stable ROMs of Xiaomi phone can download “Xiaomi Red Envelope Assistant (小米红包助手)” on the Xiaomi app store. Materials: Arduino Mega2560 (with USB interface, the core circuit board with 54 digital input and output, suitable for a large number of IO interface design), bread board model, DuPont line, key switch, acrylic board, rubber band, sausage × 1 (Key props). How to: Using open source computer vision library open CV analysis of picture signals, determine whether there is a new red envelope to click on. When the red packets appear, then send instructions to Arduino. Arduino will control the sausage robot arm to click on the screen three times to grab red packets.